Discovering a “spot” on the lungs can be one of the most terrifying words a patient can hear. As medical imaging continues to improve our ability to detect disease, we inevitably discover more findings that may or may not be important. Fortunately, the majority of lung nodules found either on screening or incidentally end up being benign. Nevertheless, there is a tremendous amount of anxiety for patients wanting to know the true nature of their own findings. 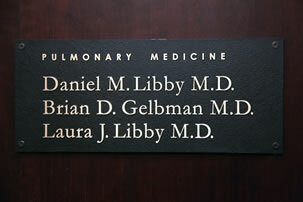 Our doctors are nationally recognized as experts in the management of lung nodules and the diagnosis of lung cancer. We have extensive experience in evaluating abnormal findings on CT scans and Chest Xray. Dr. Daniel Libby was involved in the early trials of Early Lung Cancer Action Project (ELCAP), one of the pioneering studies to demonstrate that CT scans can detect lung cancer in the earliest stages, when the disease is curable. Controversial at the time, the idea of screening former and current smokers for lung cancer has now become acceptable, proven in large part by the National Lung Cancer Screening Trial. Our doctors partner with radiologists from lung cancer screening programs at the New York Presbyterian Hospital and Mount Sinai Hospital. When further workup is necessary, our doctors are trained in Navigation bronchoscopy (see video below) and Endobronchial Ultrasound guided bronchoscopy. These are advanced bronchoscopic techniques that allow sampling of suspicious nodules and lymph nodes inside the lung.